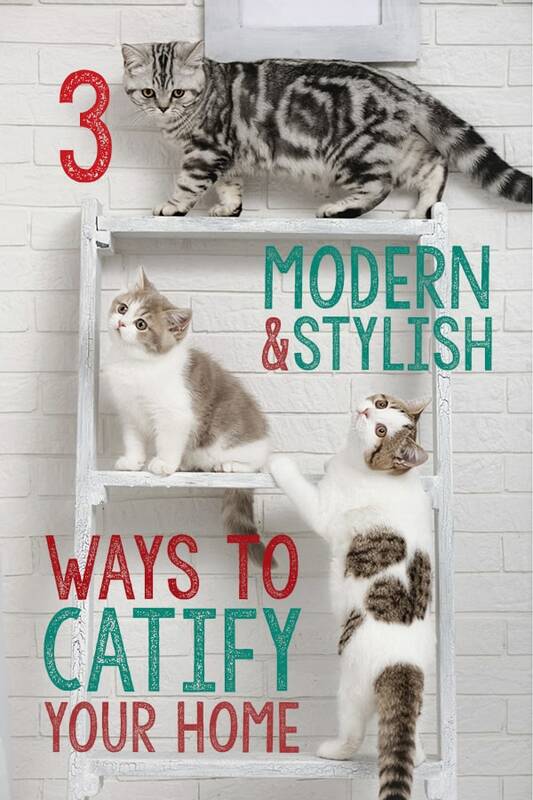 Cats are natural climbers, and the most significant improvement you can make to catify your home is to add more vertical space. One way to add vertical space is with a tall cat tree. Gone are the days where cat owners would throw a tacky cat tree in the corner and call it a day. 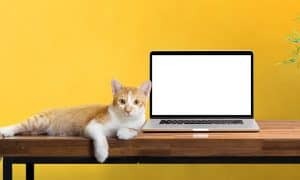 Have no fear – there are tons of stylish and modern cat trees available that will look more like beautiful pieces of furniture in your home than typical carpeted cat furniture of the past. Some beautiful examples are the Sebastian Modern Cat Tree by Designer Pet Products, the Lotus Tower Cat Tree by The Refined Feline, and the budget-friendly but beautiful Vesper by Catit. 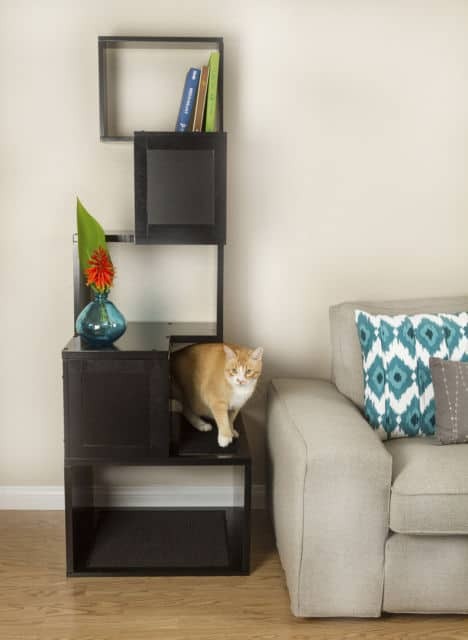 If you don’t have the floor space for another large piece of furniture but still need to add vertical space, you can easily accomplish it with cat shelves. 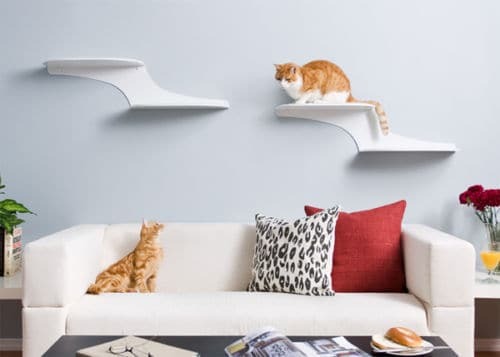 Available in nearly every finish imaginable to match your existing decor, cat shelves can be hung on your walls in any arrangement to suit your space and your feline friend. Try these stretched fabric lounging shelves and choose the wood stain to suit your taste! Or check out the Cat Clouds Cat Shelf by The Refined Feline. Don’t just think of a cat scratcher as a tool to save your furniture. Yes, they are good for keeping the claws off of the couch, but your cat needs to scratch! 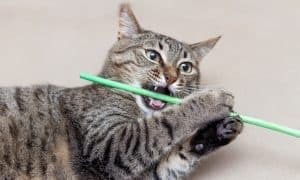 Scratching is your cat’s way of marking her territory, exercising, stretching her muscles, and keeping her nails in shape. If your cat likes to scratch on horizontal surfaces, like your living room rug, give her a scratching pad to use instead. 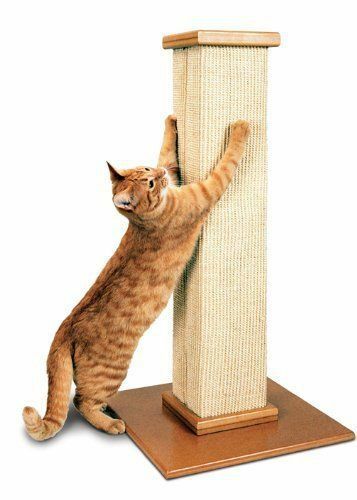 If kitty is prone to scratching vertical surfaces, like the arms of your sofa or your curtains, a scratching post is ideal. Scratching pads and posts should be near where your cat likes to hang out and, since they use them to mark territory, near pathways. Since they need to be out in the open in order for your kitty to make use of them, it’s a good thing there are so many stylish scratching posts available that won’t be an eye-sore in your home. Some great options are the paw-some tall Premium Scratching Post by AmazonBasics or this cool, curvy scratching pad by PetFusion that won’t look out of place in modern decor. You’ve added vertical space and provided appropriate scratching surfaces for your kitty. The next step in complete catification is to provide hiding places for your feline friend. A cat who’s frightened will almost always look for a safe place to hide, and in order to make kitty feel secure and relaxed, it’s important to provide hiding places. 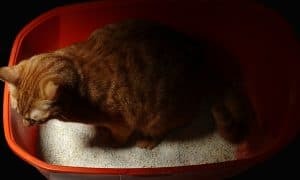 Any cat parent who orders from the internet probably knows how well cats love boxes – and that’s partly because they provide a safe and secure place for your cat to hide and observe his domain. If you don’t want to leave a cardboard box out for your cat all the time, you can find a great number of stylish cat hideouts. 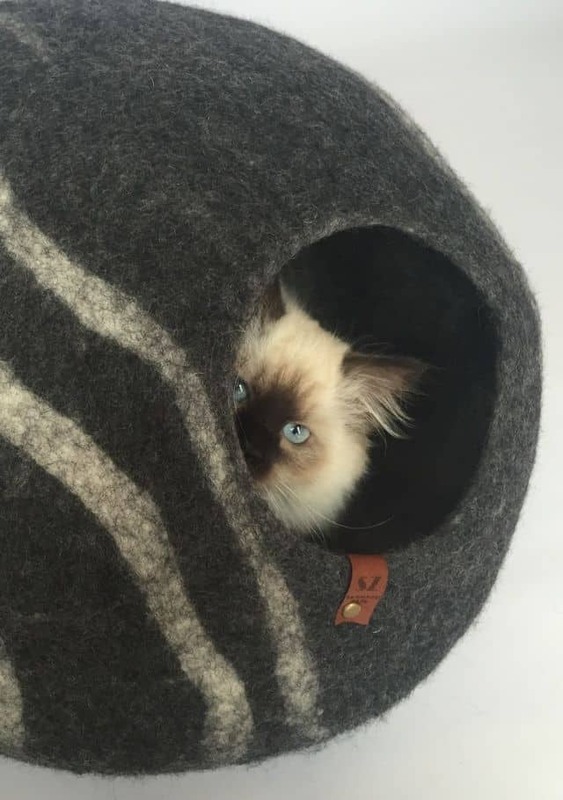 Take a look at the Hepper Pod Cat Bed or try a beautiful felted wool cat cave bed. What steps have you taken to “catify” your home? 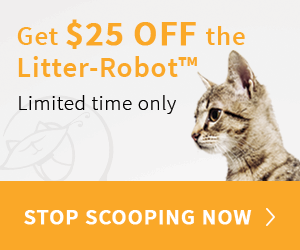 What changes did you see in your cat after you did it? Tell us!